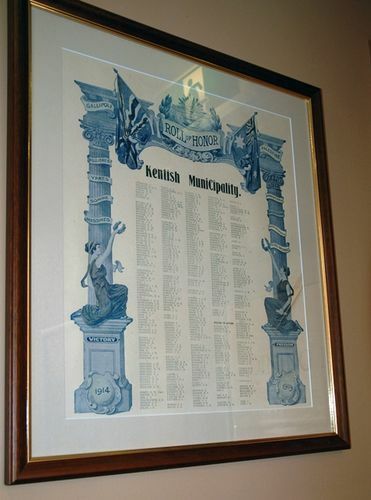 A framed printed paper honour roll commemorates 403 men who served in World War One. A circular to head teachers of state schools has been issued by the council clerk asking for their co-operation and assistance in the compilation of a municipal roll of honour. Teachers are asked to take such steps as they deem best to obtain the following information in their portion of the district:-Full Christian and surname of soldier, regimental number, battalion or unit, date of enlistment, place of enlistment, whether killed, wounded, sick, or on active service. ; any other information that may be, of assistance to the committee. Relatives and friends of soldiers are requested to forward to the head teacher of the nearest school the information referred to. Examiner (Launceston), 10 December 1917.